A transparent liquid, which is extracted from plant distillation, still has the natural aromatic smell of plants. 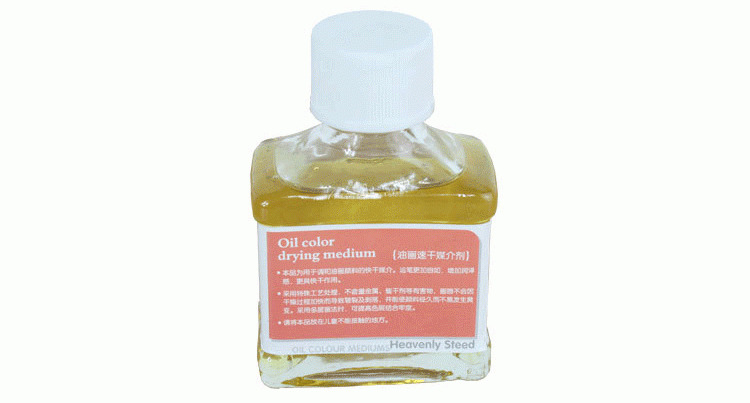 When it is used for mixing oil colors, i can keep the color coating wet. This product is a semi-water emulsion, which can increase adhesion of the color. The damar resin and cellulose are non-volatile, and with their strong adhesive performance, the colors can firmly attached to the canvas, and produce inferior smooth effect. The color shade and brightness will not change but even more glossy and moist. Drying time: 12-16 hours. The adhesion and fastenness would be hightened between each layer. Oil of spike lavender, also known as lavender oil, is one of the major medium of the European classical traditional painting. Which is made from the whole spike lavender plants with a light scent. It is pure and transparent, and without any impurities.